Of the seven major hiking areas in Hocking Hills State Park – Rock House is one of the more remote locations yet very popular with visitors and offers a unique experience for those who hike the trails and enter the Rock House. Every season offers a special visit. The Rock House has a 25-foot-high ceiling, the main corridor is approx. 200 feet long and 20-30 feet wide. A significant geologic feature that was carved out of the middle layer of the Blackhand Sandstone that graces much of the Southwestern Hocking Hills. The Upper Blackhand Sandstone is a highly cemented cross-bedded layer and the bottom section is quite resistant to erosion. The middle layer, from an ancient shallow seabed, is much more prone to erosion from the elements. The sandstone also has occasional joint fractures of the rocks and, in the case of the A Rock House, there is a long joint fracture that runs its length and several fractures in the opposite directions that form the windows and door. When visiting this you can look at the ceiling of the Rock House and can see the main fracture and most of the year see the water as it seeps within the structure and continues its age-old erosive process. One can also see remnants of where past visitors used this as a shelter and if you look closely you can see the small cavities in the rear wall that were used as ovens for baking by the Native Americans who visited here. Building a fire heated the rocks throughout and allowed a rough way to bake their food. Other reminders are rough gouged troughs in the floor of the Rock House. During rains the springs that seep into the interior flow into these holding containers and overflow out the windows. The “guests” could use this to provide water without venturing forth and having to gather it. Today the Rock House trail is about a 1/2-mile-long and takes 30 to 45 minutes to wander about. In older times a visitor would park in the orchard and walk to the cliff edge and look about until finding a 20-foot ladder descending to the middle layer of sandstone. The hiker would follow this down until they could no longer proceed. Looking around one finds them self-following a high rock wall from 20 to 80 feet high. With a bit of searching the entrance to Rock House is discovered and its wonderment brings fellow adventurers to this place, in earlier times, and of the considerable visitors today. Given the beauty of the Rock House it has been an attraction for tourists since the early 1800’s. 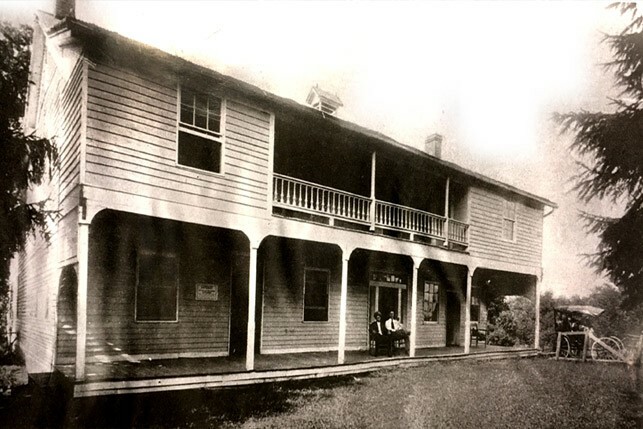 A Colonel F. F. Rempel form Logan built a 16-room luxury hotel complete with a ballroom, horse stables and a Post Office in 1835. This was located where the shelter is today just off Route 374. A story is told of a woman spurned by her lover and committed suicide at the hotel. Today her spirit walks the grounds in search of her love. There is quite a lot of folklore associated with the Rock House. 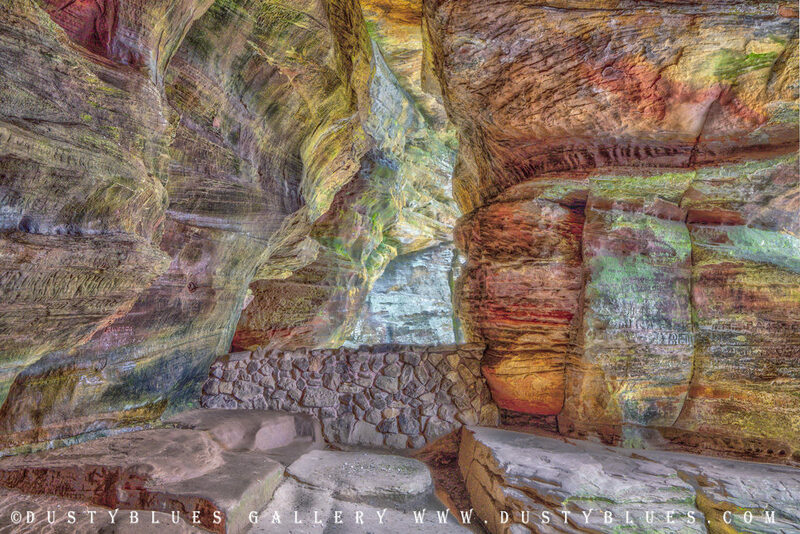 Bootleggers, thieves, robbers, and even murderers were said to have used the Rock House as a safe getaway place. Local folklore states that this is the last place in Ohio where a person was killed by a bear in 1864. After allowing your eyes to adjust to the dim light inside the Rock House you can find numerous chiseled names and initials, many with long-ago dates as they are guarded from most weathering and erosion. The park is open from dawn to dusk. Hikers must stay on the trails. 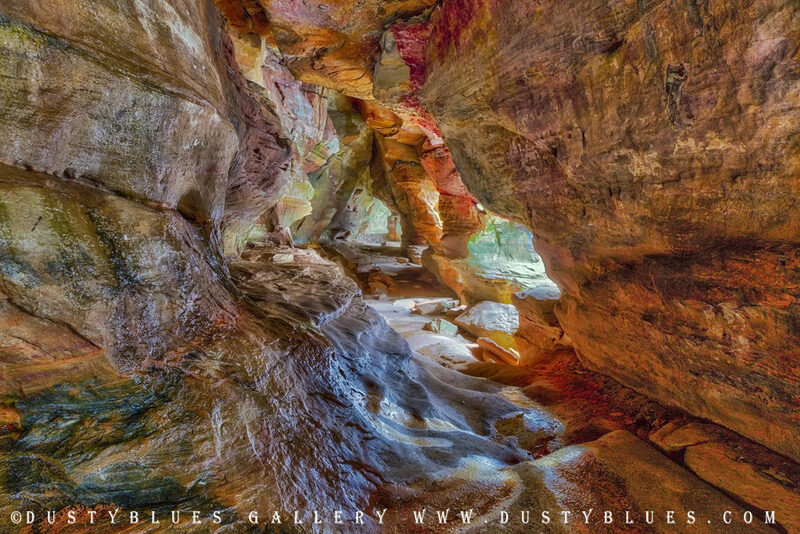 This entry was posted in Fine Art on April 16, 2019 by Dusty Blues.